The new watch face lets you take action on emails, calendar notifications, and other details. 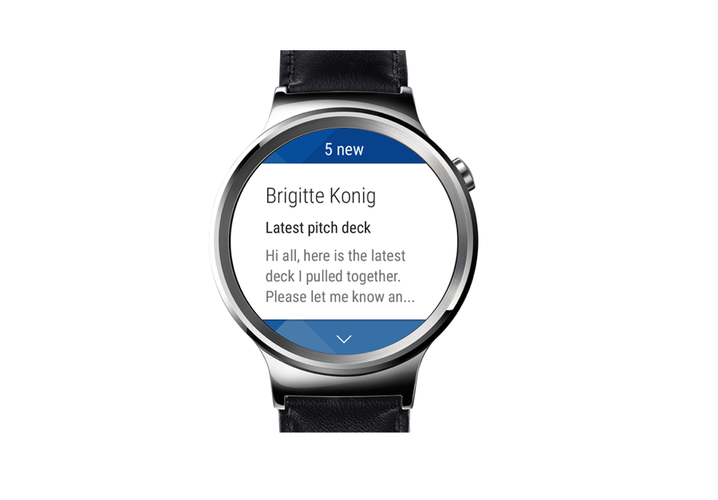 Microsoft wants to turn your Android Wear watch into a smart email companion. An update to the Outlook app for Android creates several watch face choices to transform your smartwatch into a personal organizer tool with a few splashes of color. As detailed on the Office Blog, the new watch face gives you an overview of your schedule and includes a list of who’s sent you a new message. You can also change up the color options if you want to match your outfit or just add in some new color for the day. You get several color choices with Microsoft’s new Android Wear watch face. When you get email notifications you can tap them to archive, schedule, flag, or delete it. You can also accept or decline calendar invites. Microsoft says this is just a first effort, so you’re encouraged to send feedback about new features from the Outlook app’s settings. To try this out, you’ll need to have the latest version of Outlook for Android, which you can grab from the Google Play Store. Why this matters: Microsoft has gone all-in with Android, making its core Office suite a prime contender against Google’s productivity apps. The better that Outlook and the rest of Office work on Android, the more likely Microsoft can win over subscriptions to its Office 365 service. This new watch face may or may not persuade you to move away from Gmail, but if nothing else it shows how serious Microsoft is from making its tools perform well on Google’s operating system.